Have you ever thought how museums can generate revenue by providing eMembership cards to their members? 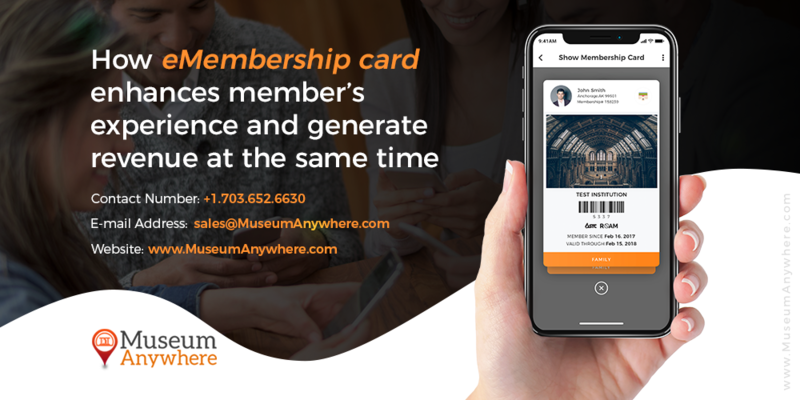 For museums creating a digital experience for their members can not only provide immense benefits to the members but they can also leverage the digital membership card to generate revenue. A plastic membership card can get lost in the clutter and easily forgotten. As a museum owner, you must be willing to provide your members a cutting-edge, interactive experience that enhances your exhibits and bring the museum, zoo, historic site, science center, aquarium experience to a whole new level. Here comes eMembership card for the museums by MuseumAnywhere. For museums, membership renewal doesn’t always come easy. From the moment a member joins, you need to establish a connection and give privilege that makes them feel valued. Otherwise, you might face the much-dreaded membership churn. The traditional method of membership process is a bit time taking, and talking about the membership renewal, museums have to spend a lot on reminding their members about the renewal. Majority of respondents use email to get members to renew. With no surprise, email are cost-saving but are they really effective? Coming straight to the point, museums have to spend a lot on outsourced mail-house or internal costs of printing, separating, matching with the letter, stuffing envelopes, mailing, supplies and staff time. It really becomes hectic for a museum to call their members about 2-3 times a week just to remind them about their membership renewal. Once the membership gets lapsed, there are fewer chances if the members would renew it, but in our eMembership solution the members would get notified with a link which would take them to your membership renewal page. For such a case, a notification received on their smartphone is more effective than receiving an email which would let your members respond to the renewal reminder not without taking much of their time. When we talk about how eMembership can leverage the museums to generate the revenue, it’s very simple to understand. Our eMembership card is a solution which has been designed by keeping both the members and museums in mind. The eMembership card is smart and it knows when the renewal date is approaching. Its starts to notify your members 60 days prior to the expiration date. Also, the frequency could be customized as per the museum. This would help the museums to get better revenue on the renewal of the membership while saving the cost of mailing the renewed membership card. 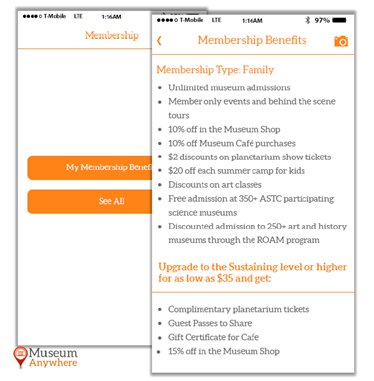 The eMembership App allows the museum staffs to provide up-sell module within ‘My Membership Benefits’ option, where museums can shows promotional upgrade messages, prompting members to upgrade to next higher membership level. Consider what makes the most sense to offer the best to your members and you’ll be well on your way to increasing revenues while providing a better experience to your members. Mostly renewal management staffs are under constant pressure for reaching out the members for membership renewal and make sure that the existing members receive the reminder emails on the right date. With eMembership cards for museum, the renewal process comes with greatest benefit that you immediately win back hours of time. This allows you to think more strategically, developing and providing a better member experience overall.